Mix Suite A at Rumble Audio Post, designed by Ellis Island Design. With a primary focus to serve New York City’s independent film production community, Rumble Audio Post has installed a Meyer Sound cinema monitoring system. The Brooklyn post facility is now one of three Meyer Sound-equipped post houses in the New York metro area. The monitoring system for Rumble’s mixing stage includes three Acheron® Designer screen channel loudspeakers, two X-800C cinema subwoofers, six HMS-5 cinema surround loudspeakers, and a Galileo® loudspeaker management system with two Galileo 408 processors for system drive and optimization. Alternate presets in the Galileo processors allow push-button setup for television series, advertising, or web-based content. The system was supplied by Sonic Circus of Townshend, Vt.
Billia first learned of the Acheron Designer loudspeaker in news stories about the system installed in the screening room at Francis Ford Coppola’s American Zoetrope Studios. In his first months of operation, Billia mixed “Pills,” a music-laden short film directed by Craig Zobel, and two feature-length films, one of which was accepted to the Sundance Film Festival. Rumble’s mixing stage includes an Avid ICON D-Control console, a complete Pro Tools HD system, a Panasonic PT-AE8000U projector, and a rack of high-end analog outboard processors for sound design applications. Room acoustics were handled by Dave Ellis of Ellis Island Design. 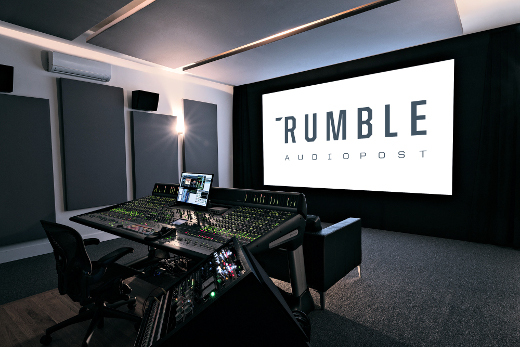 In addition to its main mixing stage, Rumble Audio Post offers a foley stage and a recording booth for voice-overs, ADR, and narration.